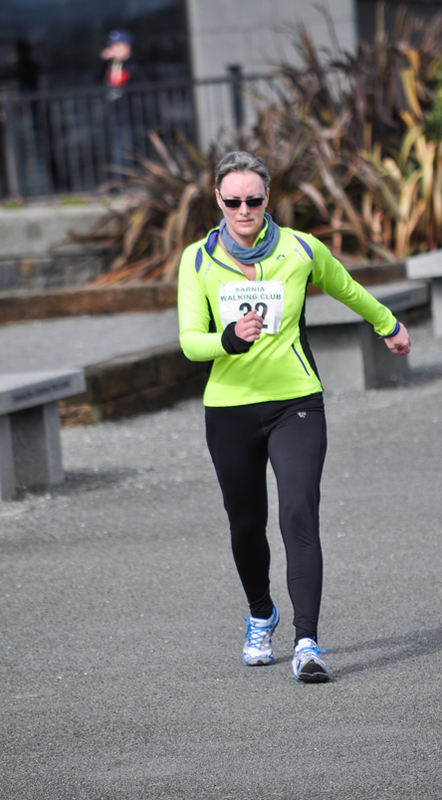 Newcomer Donna Allan, has now completed her first handicap race season with the Sarnia Walking Club and has won the Bob Wright Memorial trophy. 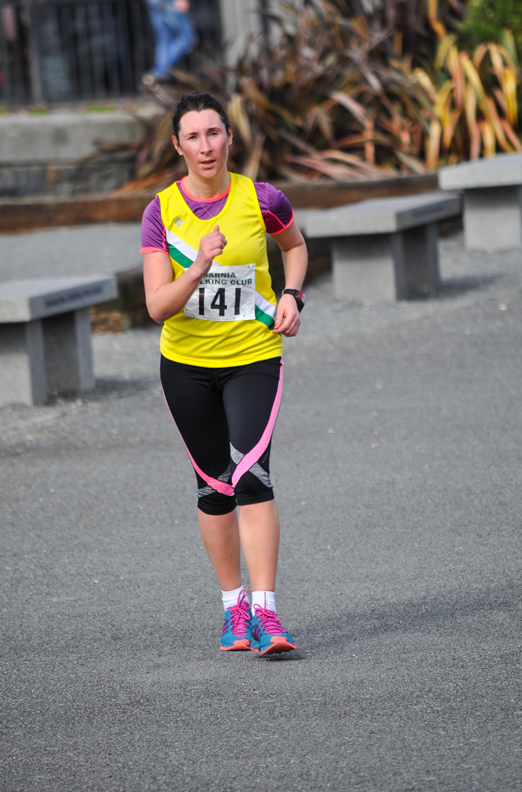 Consistently bringing her race times down since last September she ended the series with another win overtaking Olga Le Noury late in the race to move into the lead and cross the line in an actual time of 49.20 for a new Guernsey womens age best time. With a two race discard in the seven race series she headed the final table with 98 points with a five point cushion over Peter Beckerleg in second overall. Third overall went to Stuart Le Noury who also recorded the fastest time of the day in the final race with his 42.57 clocking. 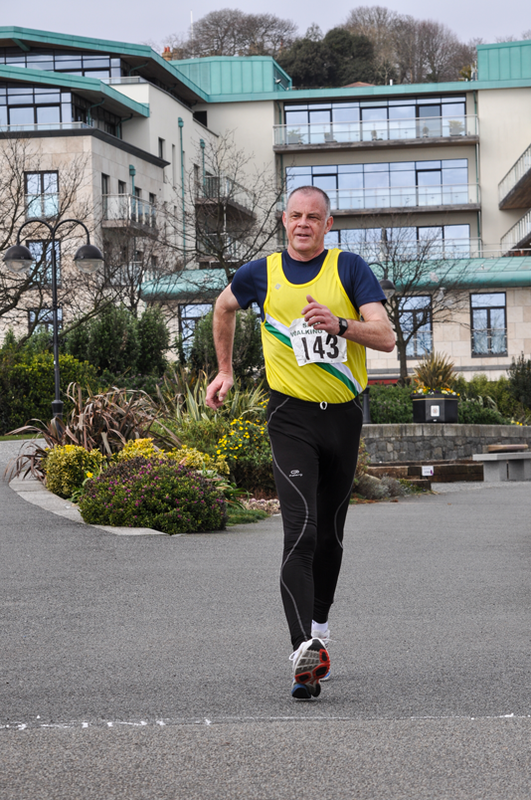 In the final event from Lancresse to North Beach and held in mild conditions, Peter Beckerleg took third place, holding off Kevin Le Noury by two seconds. Final Positions. Tied points decided by countback on number of wins. 1 Donna Allan 98 points, 2 Peter Beckerleg 93, 3 Stuart Le Noury 86, 4 Rob Elliott 86, 5 Mick Le Sauvage 82, 6 Phil Lockwood 78, 7 Kevin Le Noury 78, 8 Olga Le Noury 77, 9 Dave Dorey 74, 10 Jayne Le Noury 64, 11 Kay Coulson 58, 12 Marie Macdonald 37. Photos, top Mick Le Sauvage and Dave Dorey presenting trophy. Bottom Le Sauvage flanked by Jayne Le Noury (left) and Kay Coulson (right). 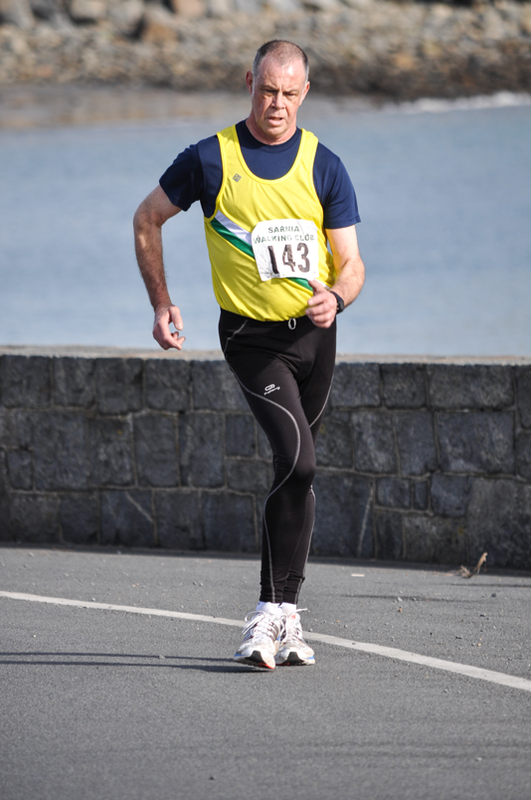 Mick Le Sauvage claimed the overall victory in the Bob Wright Handicap series which ended with a 5 miles road walk from Lancresse to the White Rock. He had to give second best to race winner Stuart Le Noury, who moved into first place late in the race after starting off in last in the handicapped event. 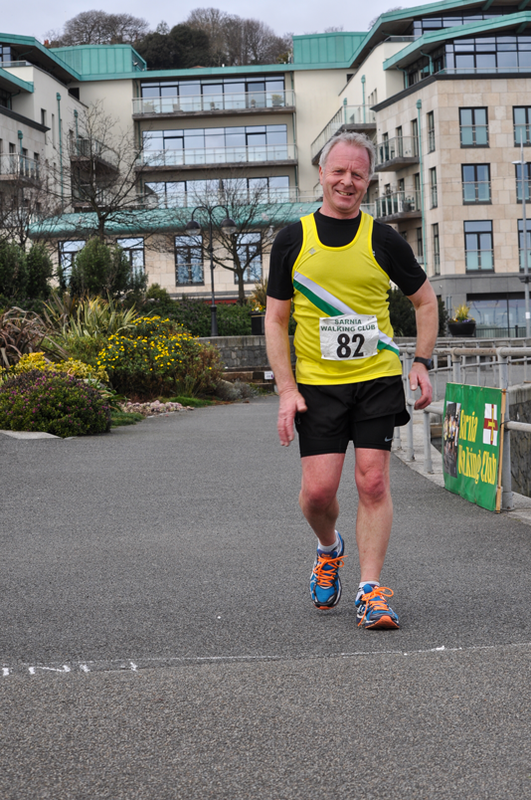 Stuart was amongst only a few of the walkers that walked to recent form and clocked an actual time of 41.16. Le Sauvage finished half a minute or so behind Le Noury on the watch, with a 21 seconds gap back to the third walker to cross the line. 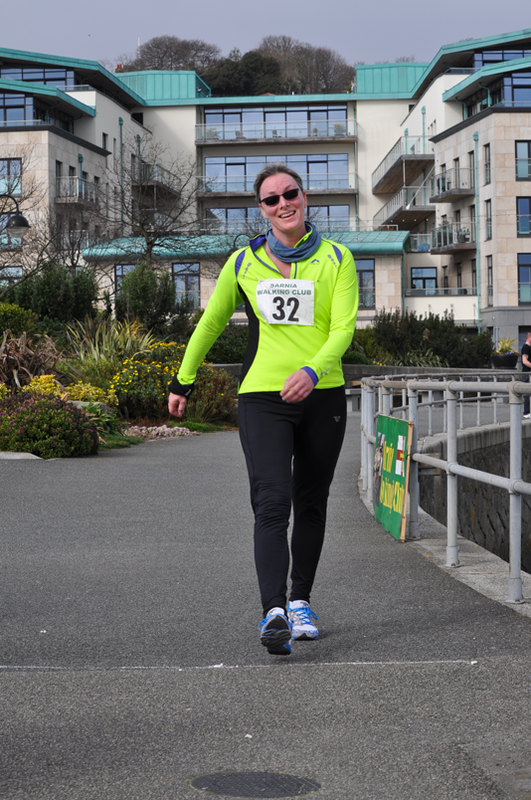 Jayne Le Nourys third place pushing her into second place in the overall standings ahead of Kay Coulson. 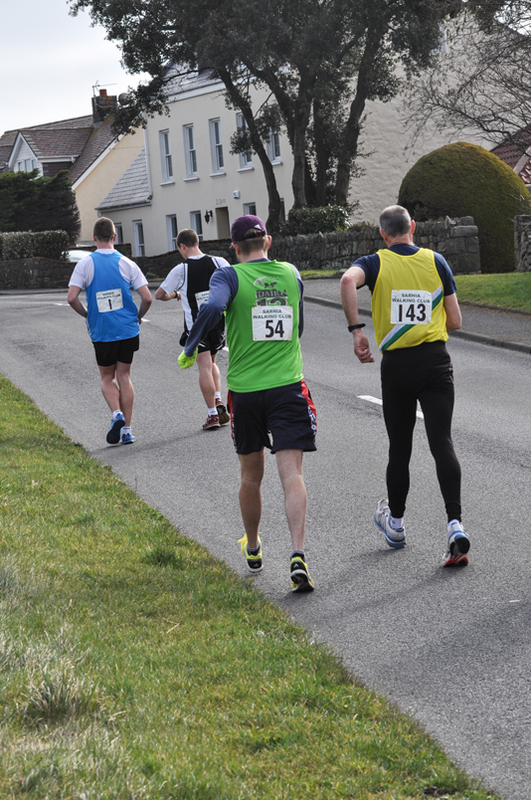 Only a point behind in fourth place overall was Peter Beckerleg who lost his chance of claiming a higher place when Rob Elliott and Phil Lockwood overtook him with only a few hundred yards to the finish. Bob Wright Series final positions, with 5 races out of 7 to score. 1 M Le Sauvage 92, 2 Jayne Le Noury 89, 3 K Coulson 88, 4 P Beckerleg 87, 5 S Le Noury 84, 6 P Lockwood 81, 7 K Le Noury 78, 8 O Sinkevica 76, 9 R Elliott 65, 10 D Dorey 65, 11 Jason Le Noury 57, 12 A Sinkevics 31, 13 M Macdonald 28. Eight local members of the Sarnia Walking Club and one Life Member took part in the recent 5 miles road walk held in Moulton, Suffolk. 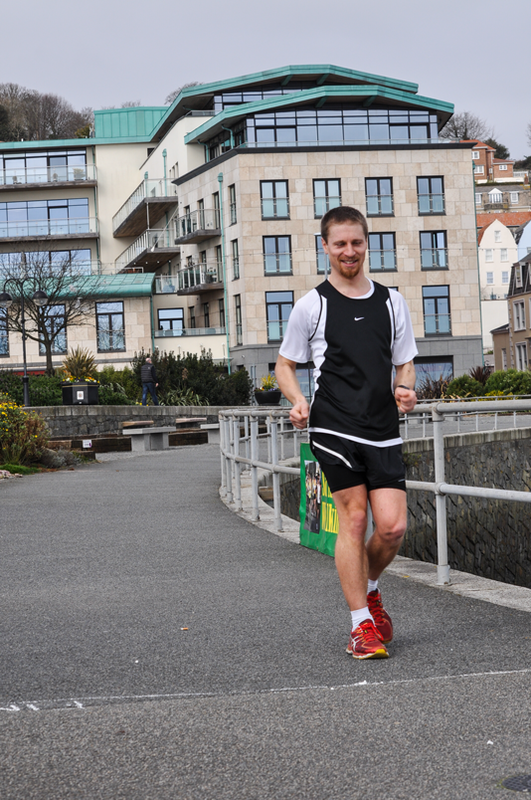 Leading the Guernsey walkers home was Stuart Le Noury in 42.33 for 6th place, almost two minutes ahead of brother Jason (9th) who had been unwell for most of the week and consequently down on his expected performance. 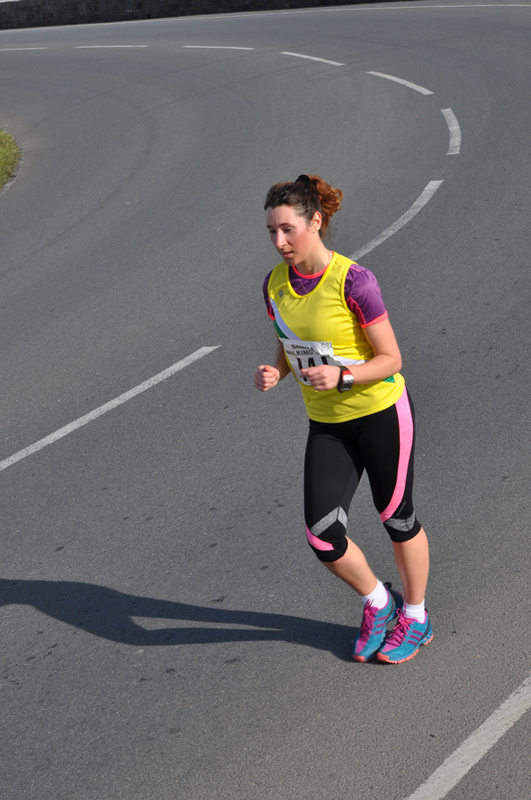 Leading Guernsey woman Olga Sinkevica, making her debut in England, removed two minutes off her previous best time as she finished in 52.21 for 27th overall and 5th woman home. Yards behind was Kevin Le Noury 28th and in 52.24. 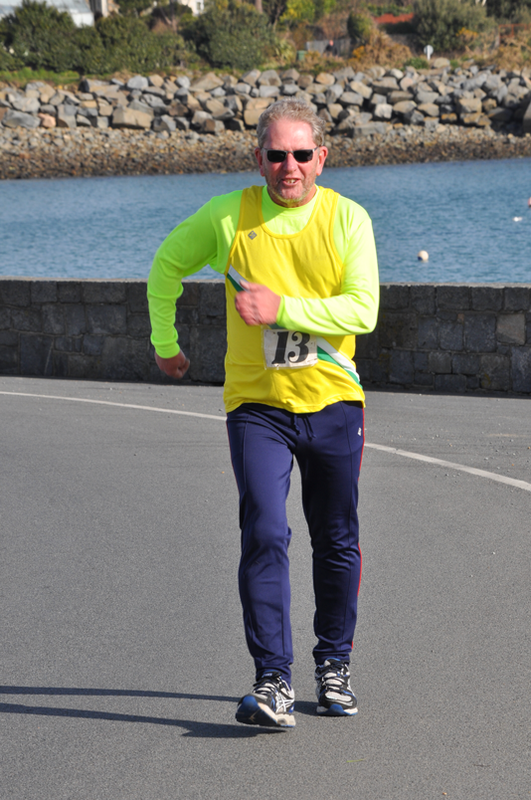 Peter Beckerleg in his first race outside of Guernsey, came home with a new personal best time of 55.34, three places ahead of Mick Le Sauvage in his first overseas race since the early 1970s and just dipping under 56 minutes. 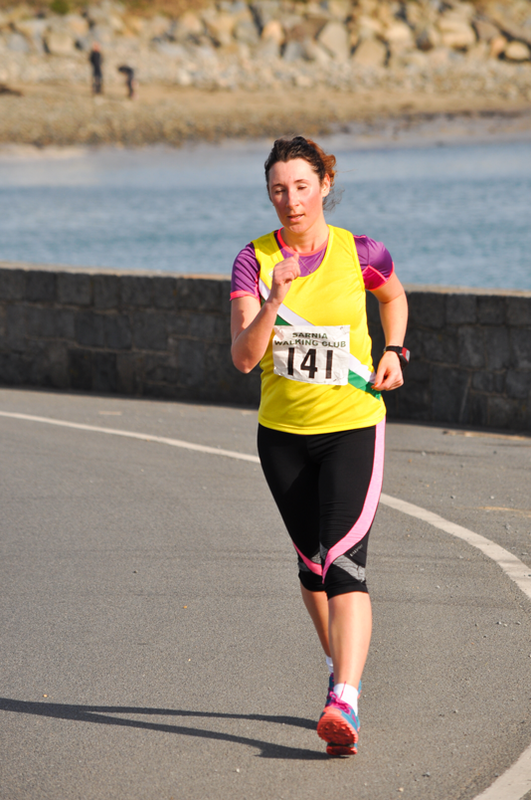 Jayne Le Noury easily broke the 5 miles an hour barrier in 46th place and 14th woman home with 57.52, whilst Kay Coulson set hereself a new best time of 59.40 for 51st place and 16th woman. 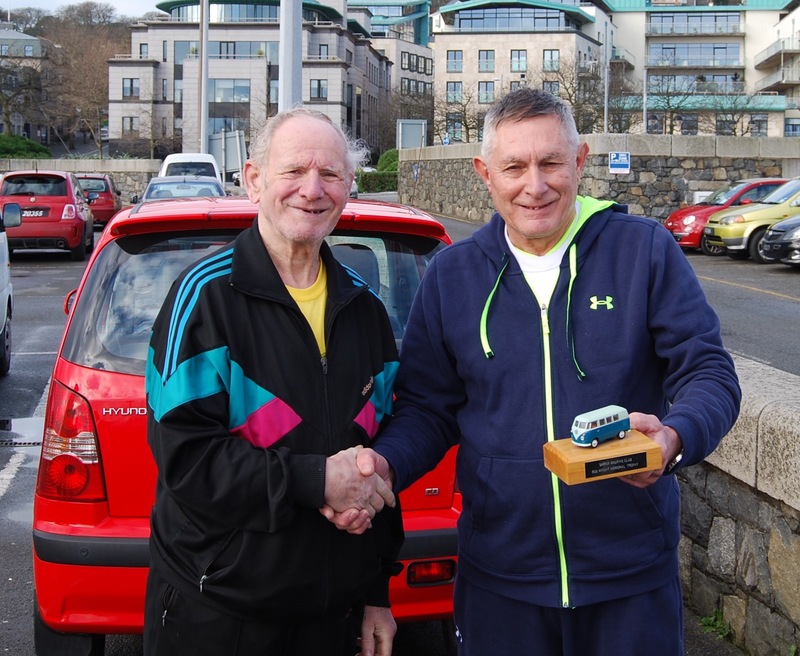 Sarnia Walking Club Life member and Guernsey Allcomers record holder for 7 miles. 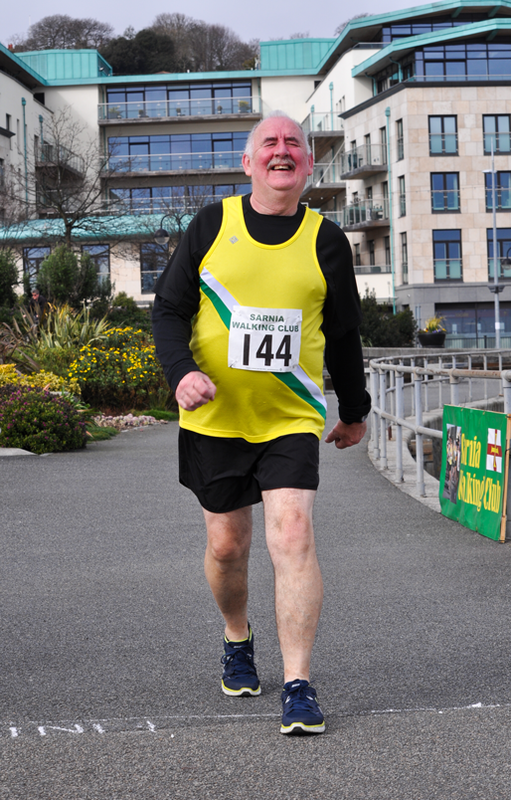 Bill Sutherland, now in his 70s walked the race in 64.05. Third Moulton Victory for Dominic King Olympian Dominic King won the Moulton Five for the third time, seeing off a strong challenge from Moulton villager Callum Wilkinson. Following Wilkinson’s outstanding performance in the recent European Cup meeting in Spain, many thought that he would triumph in his fourth outing in this popular race. However, the experienced international who is also a Centurion had other ideas and notched up his third victory in the event. 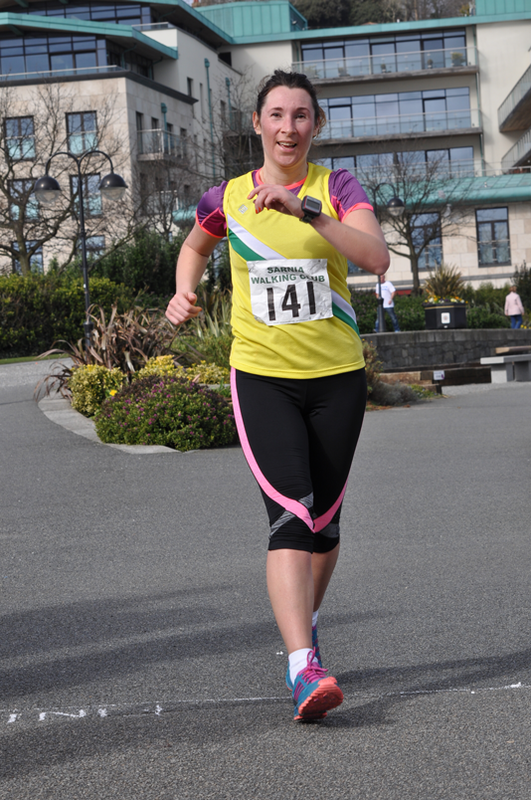 Sophie Hales making a return to the discipline was an impressive ladies winner recording the fastest time since 2005. 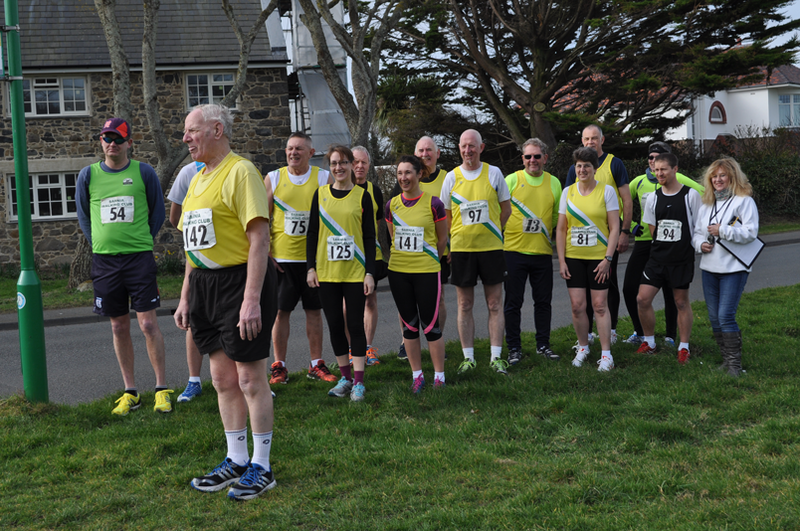 The record Field of 70 including eight Guernsey walkers made the most of the sunny, but breezy and 51 walkers bettered the hour compared to 31 in 2014. Joyce Crawford from nearby Red Lodge, who failed by only 800m to become a Centurion at Southend last autumn won the Suffolk Women’s championship ahead of Val Nutley and Rachel Webb, whilst Malcolm Smith and Phil Nutley took the men’s place medals behind Callum Wilkinson. 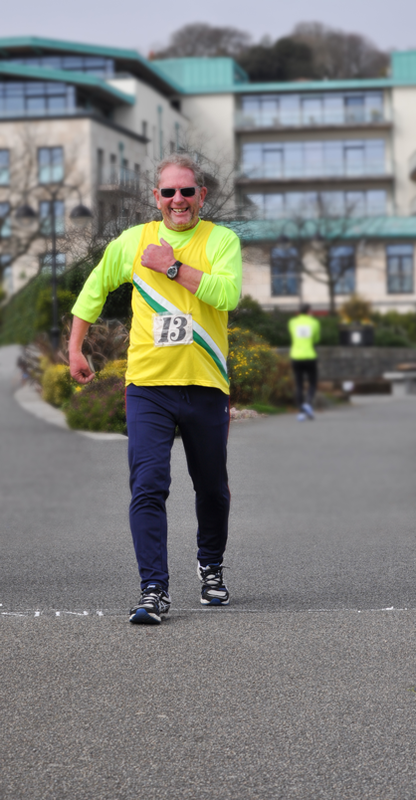 Moulton resident Ray Still a former jockey who underwent a triple by-pass operation last November although finishing last was delighted to have met his challenge of completing the distance. 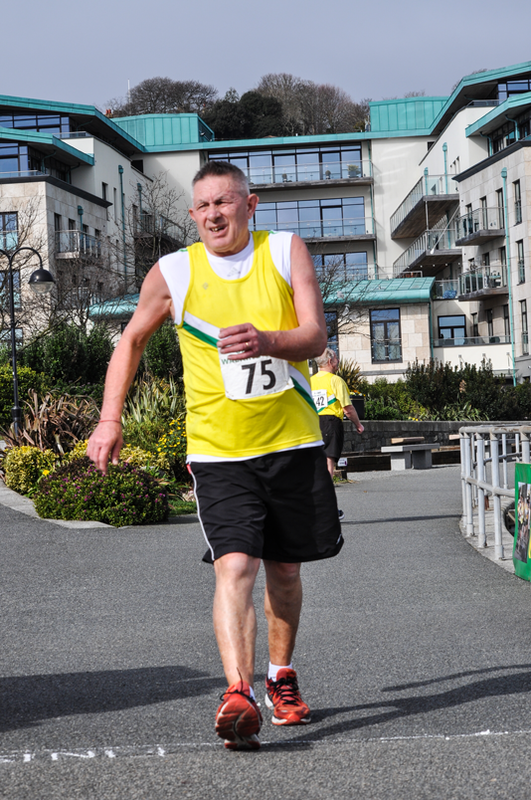 Photos taken at the 5 miles walk by competitor Marie Macdonald’s husband Doug. 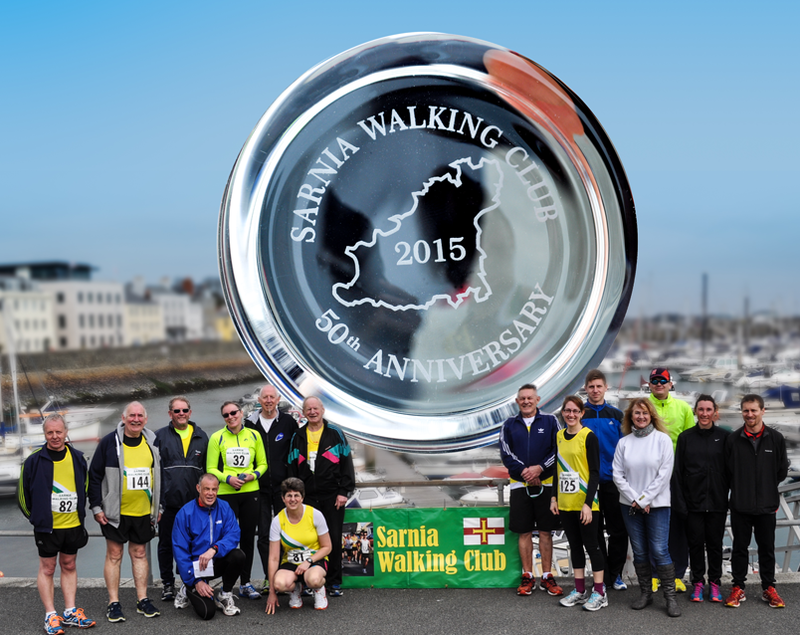 The Sarnia Walking Club celebrated the 50th anniversary of its first ever race with a 5 miles road walk from Lancresse to North Beach, over the same distance as the first walk. 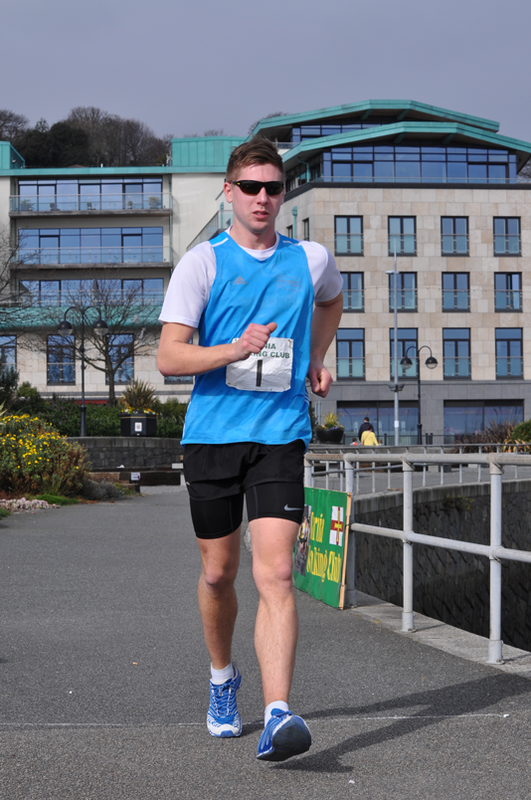 In good conditions with a slight breeze along the seafront finish, the race was dominated by the Le Noury brothers who headed the field throughout, with elder brother Stuart taking the win in 41.42, 45 seconds ahead of Jason. 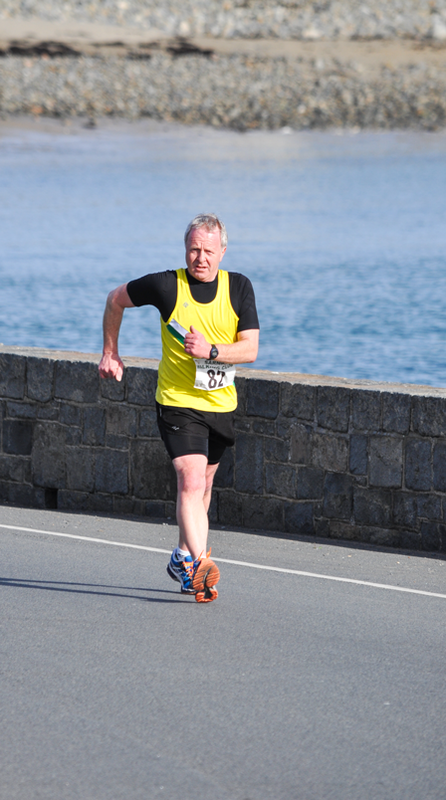 Third man home and a further three minutes behind was Rob Elliott in 45.26 and removing two minutes from the old Guernsey age best time. 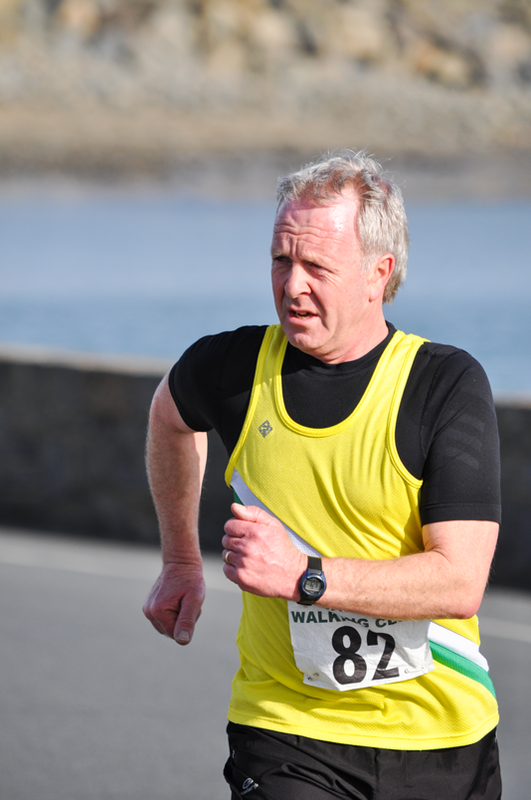 Next home was Phil Lockwood in just under 50 minutes, whilst Kevin Le Noury was two minutes too good for the leading woman.Peter Beckerleg held off the second woman home as he crossed the line in 56.09 some 11 seconds up on Marie Macdonald who held off Mick Le Sauvage by two seconds. 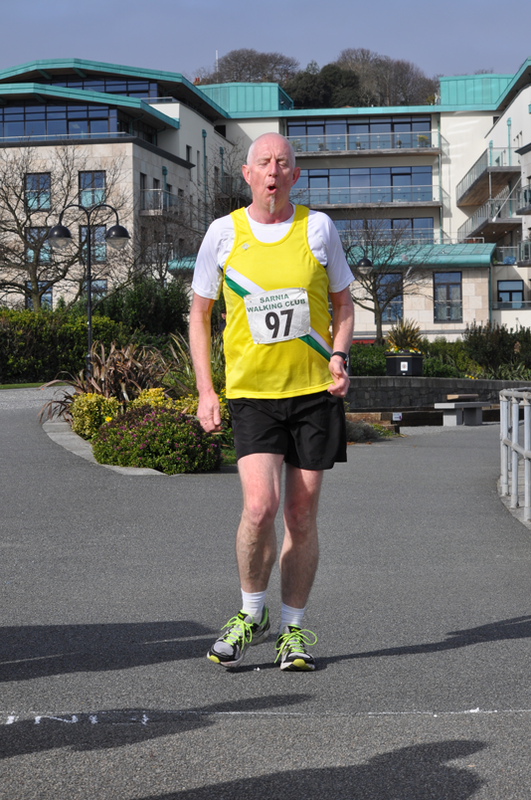 Dave Dorey, finishing in 58.50 can point to a sub 39 minutes time set in his prime many years ago. 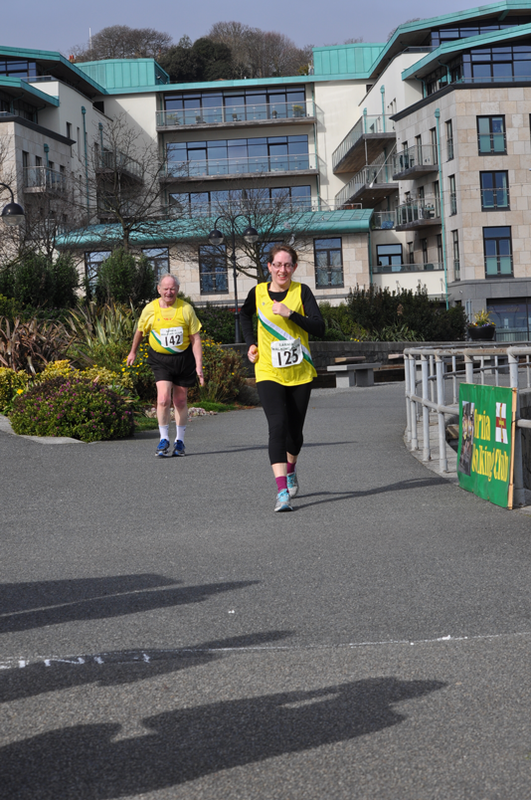 The leading woman was Olga Sinkevica who walked well to finish in 54.33, ahead of Marie Macdonald 56.20 and Jayne Le Noury 57.26. The leading womens times now rank 6th and 7th in the Guernsey all time lists, just behind the Jayne Le Nourys 5th place set back in 1983. 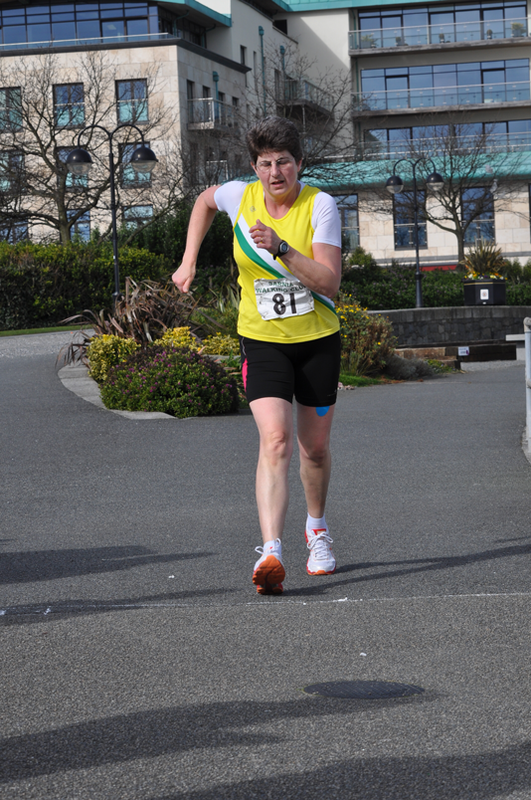 Kay Coulson the fourth woman home had a good race to finish just outside the hour barrier. 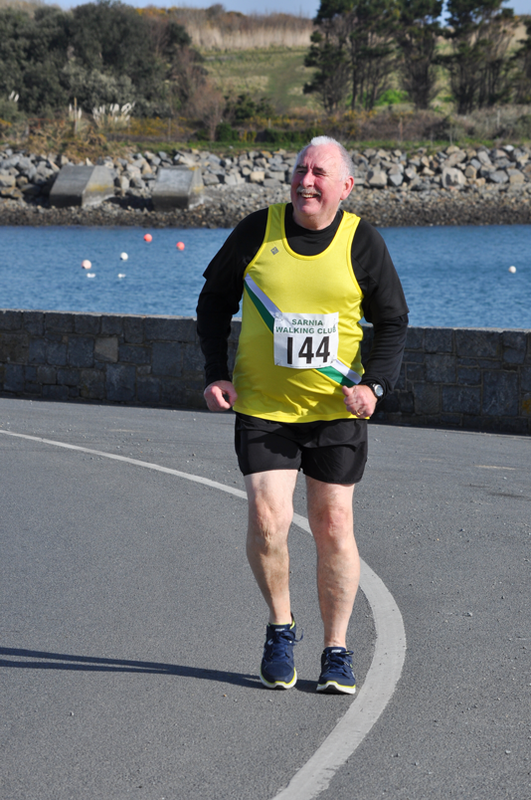 A good field of 14 walkers took part with last walker home Allan Harris making a comeback for the event after a few years absence and followed home another walker on the comeback trail in Alan Roger who walked 63.10. All finishers received a glass paperweight to mark the occasion, courtesy of the race sponsors Canaccord Genuity Wealth Management. 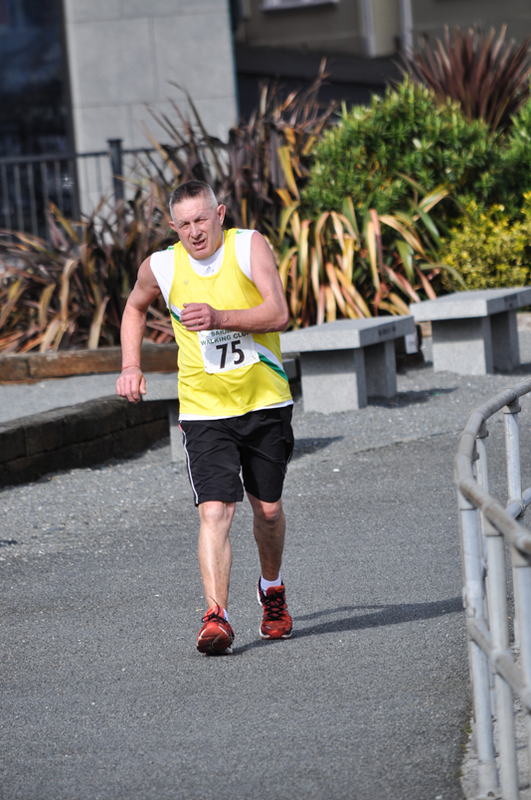 Although there was nobody present from the first event, a man who walked the fixture a year later took part. 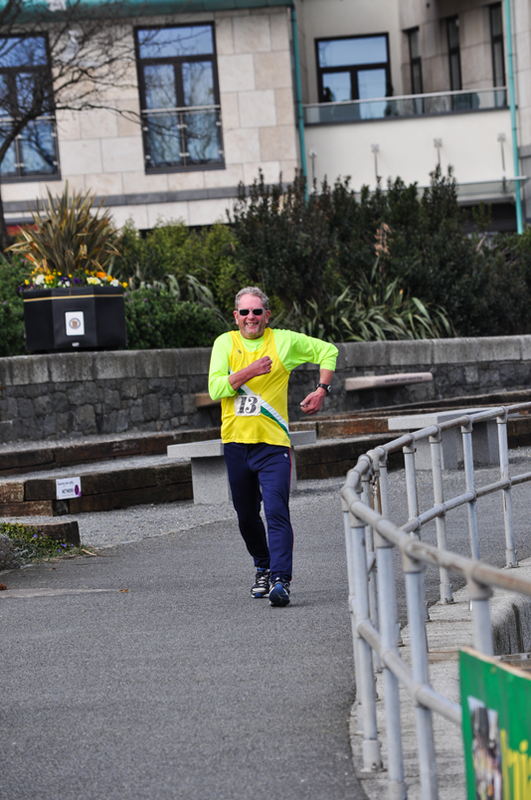 Evergreen Mick Le Sauvage completing the distance this time 56.22. 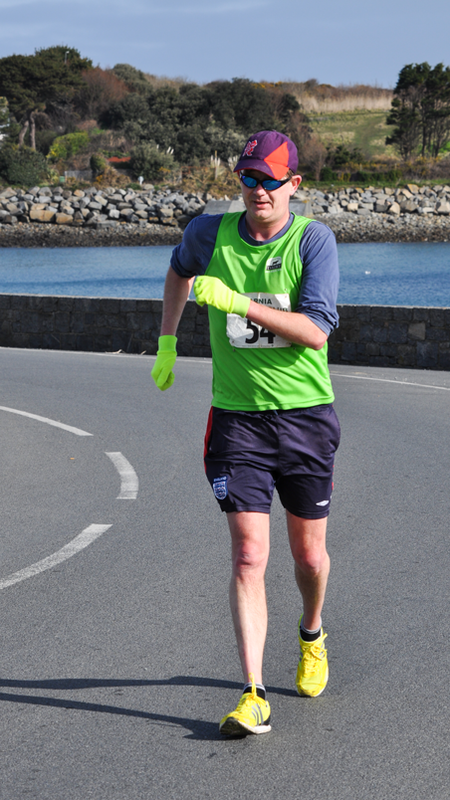 Pasted in below is a story of the 5 miles event in Guernsey written in 2011. 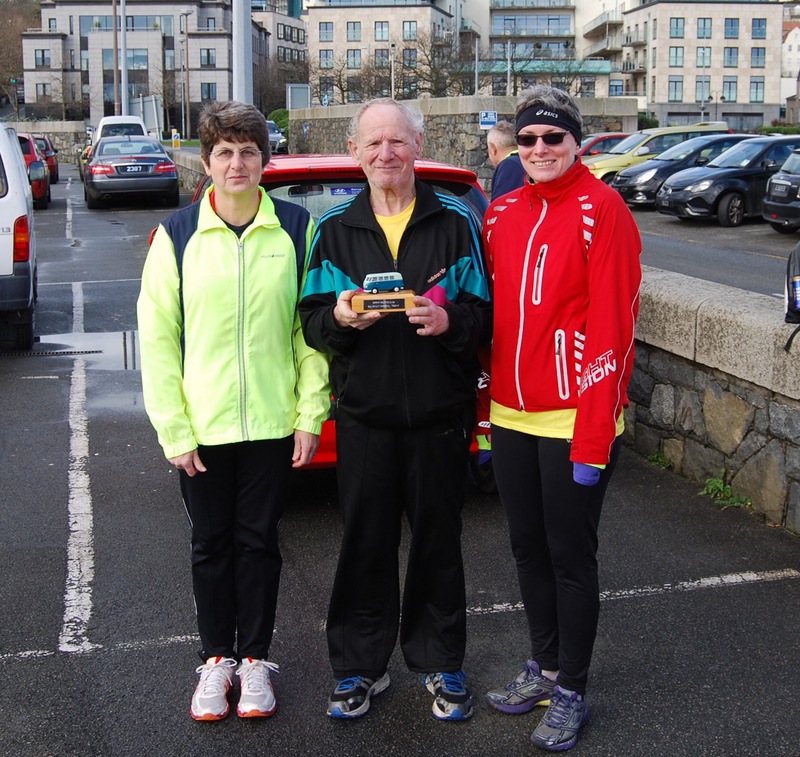 The next walk is on Sunday March 15th at Delancey Park at 9.00 am. 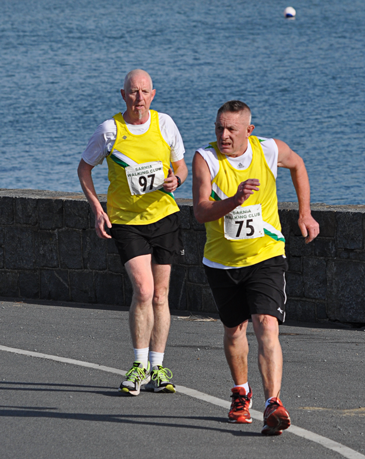 The distance is 10 kilometres and is the second walk in the club championships. Details from Jayne Le Noury lenouryjedburgh@cwgsy.net. 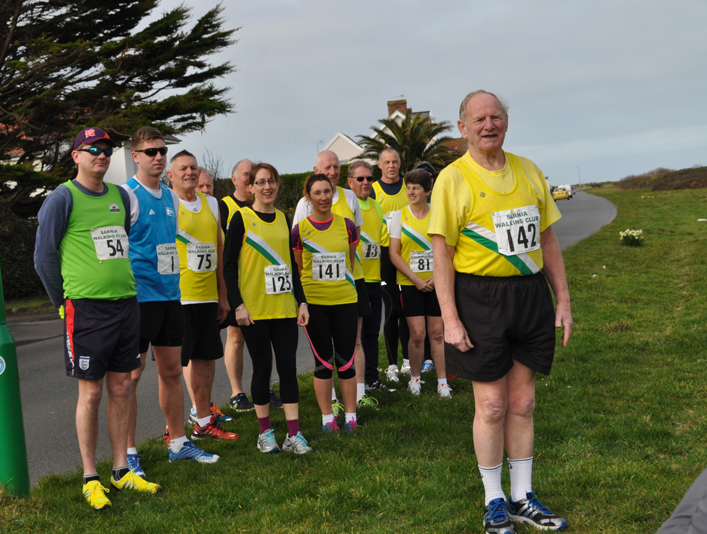 Following a comment that our newer members would like to have a go at the 5 miles distance which was popular in the UK and Guernsey in the 1960`s and through to the 1990`s, I have reproduced the Guernsey mens and womens ranking lists below plus an insight into some of the 5 miles races of the past. 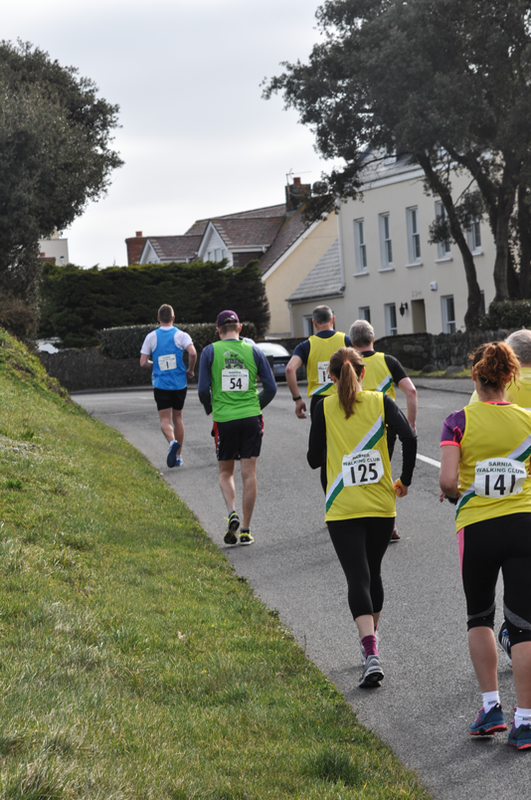 The first Guernsey 5 miles walk that I have found in the local papers, took place in May 1942, finishing at Beau Sejour, which would have given the walkers a climb at the end of the event whichever route they took. 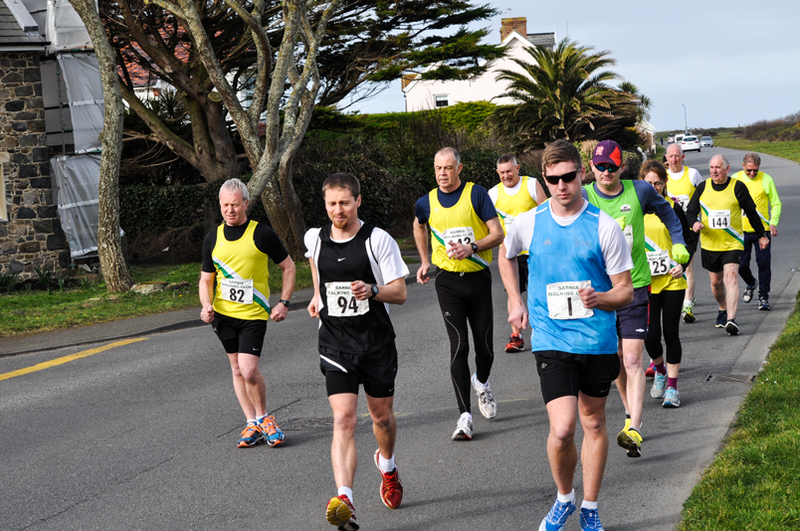 Nine entered and Norman Froome took the honours by 20 yards from Church to Church Champion Stan Smith, with H Le Marquand “inches” behind. 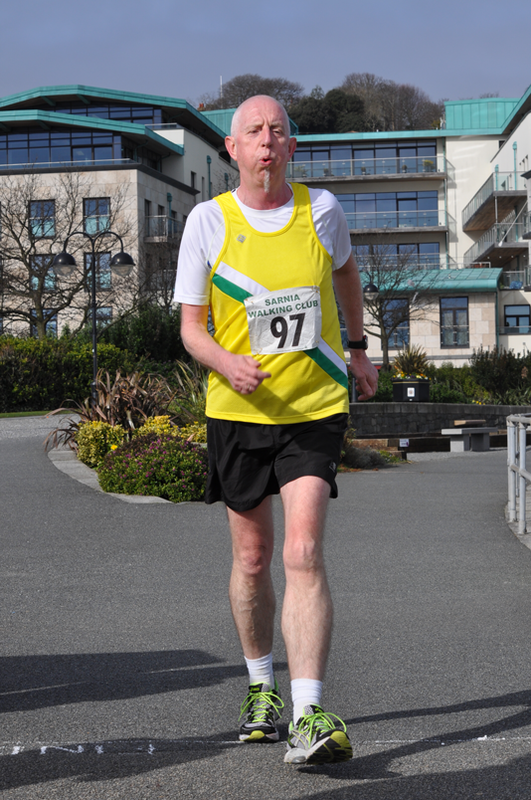 On to 1963 and the GIAAC held their first annual GIAAC 5 miles walk which was won by Graham Mann in 45.29. 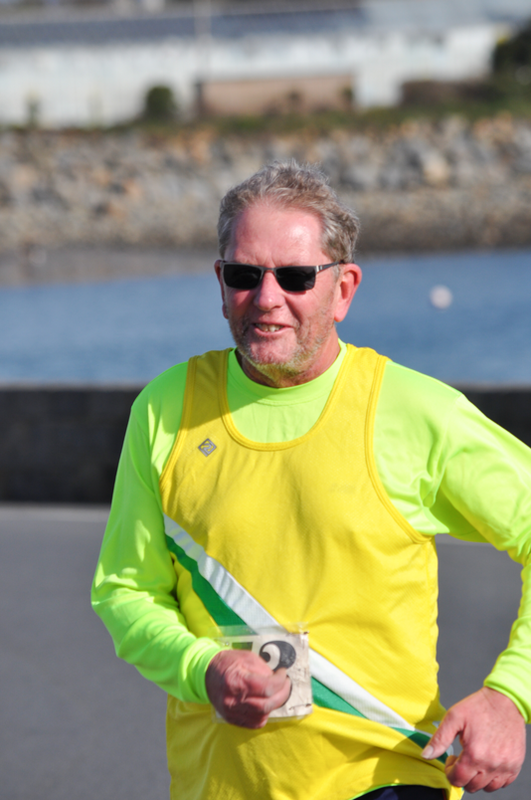 The following year Len Duquemin improved the record to 42.30 in an event held in early April. 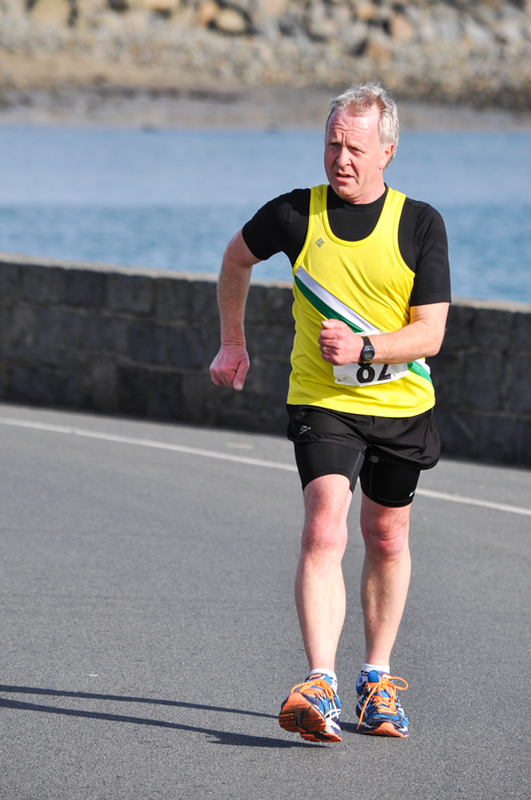 Another race a few weeks later saw John Moullin win in 43.11. The fastest lady was Winona Robert in 58.07. This was to be the final GIAAC 5 miles walk as soon afterwards the walking section broke away to form the current Sarnia Walking Club. 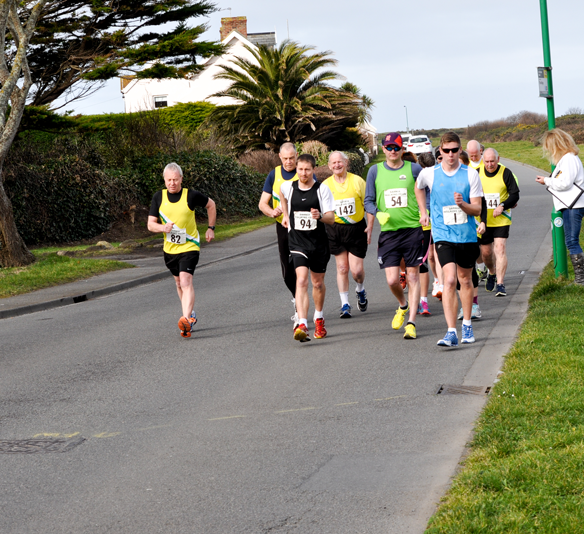 A 5 miles walk was the first event held by the SWC in March 1965. The course in those days started at Lancresse (near the current Keyprice) and followed the coast road (via Grandes Maison Road) to finish at the “BEA offices” (almost at zebra crossing in final straight of Church finish). Len Duquemin took the honours in 41.22, followed by John Moullin 42.40 and the young John Brouard (almost 17 yrs old) in 42.41. 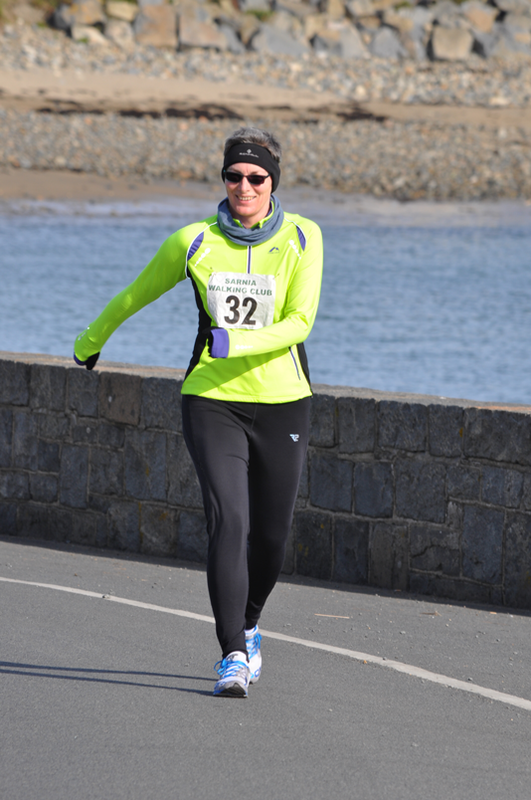 Leading lady was multiple Church to Church walk winner Mrs J H (Winona) Robert in 56.22 followed by Miss Shirley Jefferies in 56.23. In April 1967, the top locals took on Scottish walker Bill Sutherland at the distance. 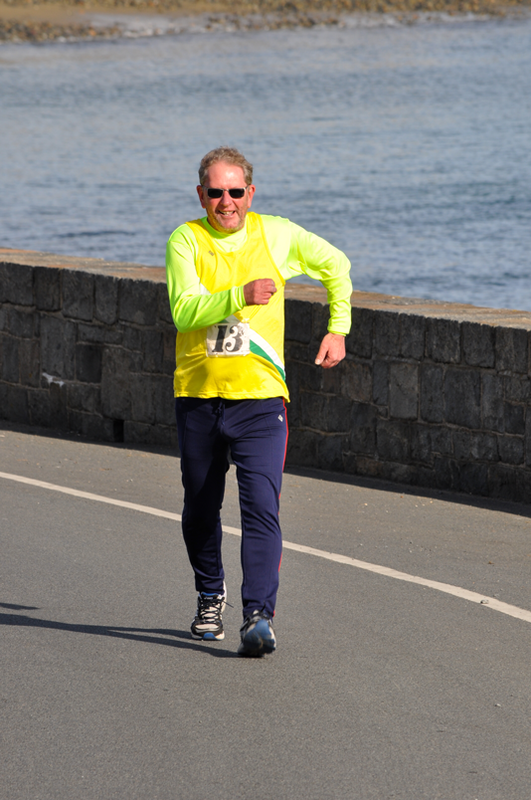 Bill, who went on to win the bronze medal in the 1970 Commonwealth Games 20 miles walk, had set a new allcomers record over 7 miles the previous year when he recorded 50.31. 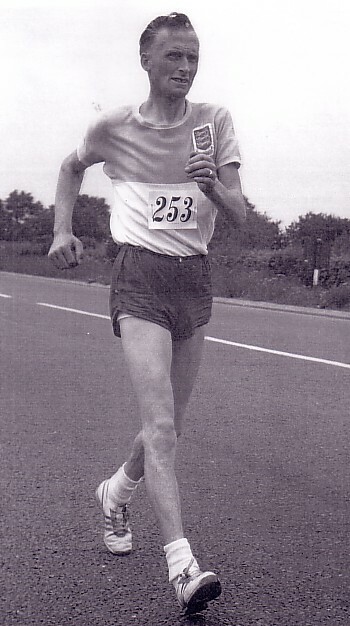 Locals were in no mood for a repeat and Len Duquemin (pictured in England, representing SWC) easily won in 36.40 for a new Island record, beating Sutherland by over a minute (37.45). 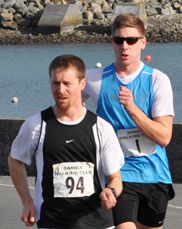 Youngsters Dave Chalker and John Brouard recorded 41.01 and 41.04 respectively. 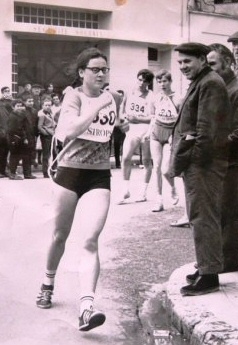 Duquemins time was to stand for many years as an allcomers best, but the womens best was demolished in 1975 when leading French walker Jacqueline Delassaux (pictured right in Europe) recorded 40.04 on the Lancresse to White Rock course, finishing second to local Champion Mick Elliott. 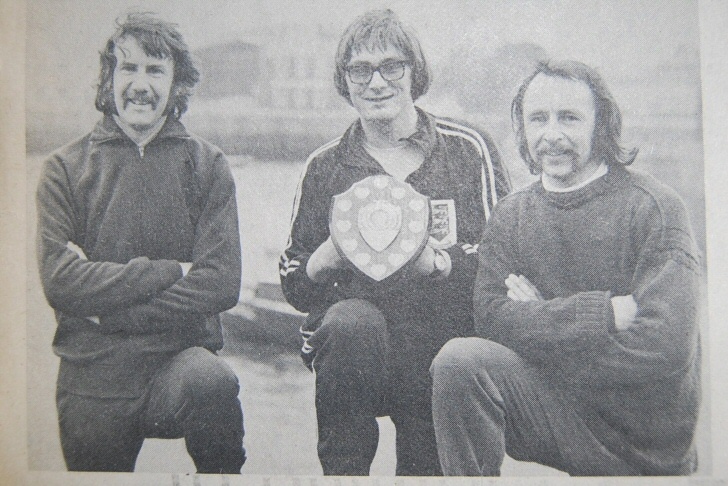 In 1969 Len Duquemin recorded 36.18 at Lambeth, England to set a new Island best time. This time survived as a record until Carl Thomson removed two seconds off it in 1991. 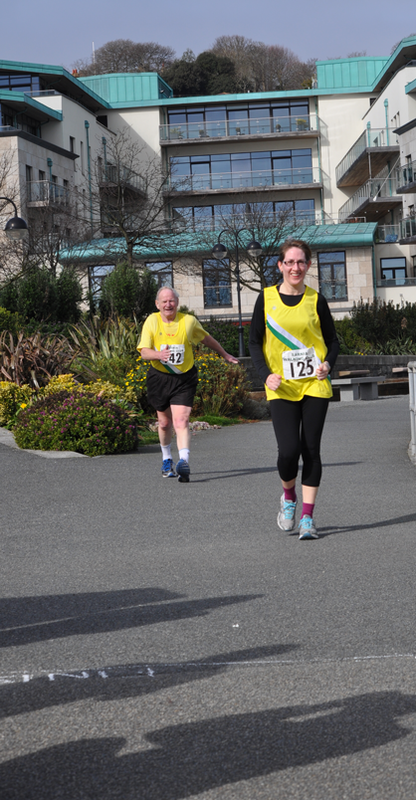 (I remember this walk well as Carl came storming past me mid race after he had started well behind me in the handicapped event). For record purposes the times only from an actual 5 miles event are considered, but there has been a better en route time. 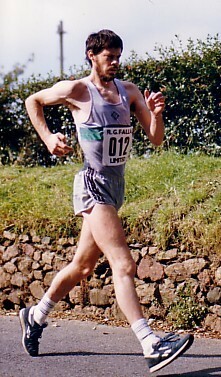 Rob Elliott (pictured walking in GIAAC run)with his best recorded time of 36.25 in the National 10 miles Championships in 1980, would have walked a minute quicker in his 10 kilometres Island Record performance. 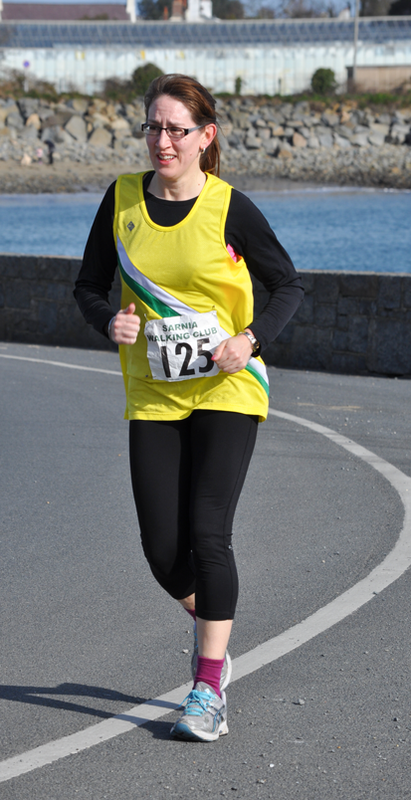 The womens best time for a Guernsey walker still stands to Jenny Elliott who walked 48.18 in 1999. Current walkers Rose Druckes, Jayne Le Noury and Carol Bates feature in the top 10 performances. The Shocking Blue Green Theme. Create a free website or blog at WordPress.com. Stuart Le Noury had a close victory over brother Jason in the 5 miles road walk held between La Passee and North Side. Walking close together for the early part of the race, it took around 2 miles before Jason started falling off the pace. 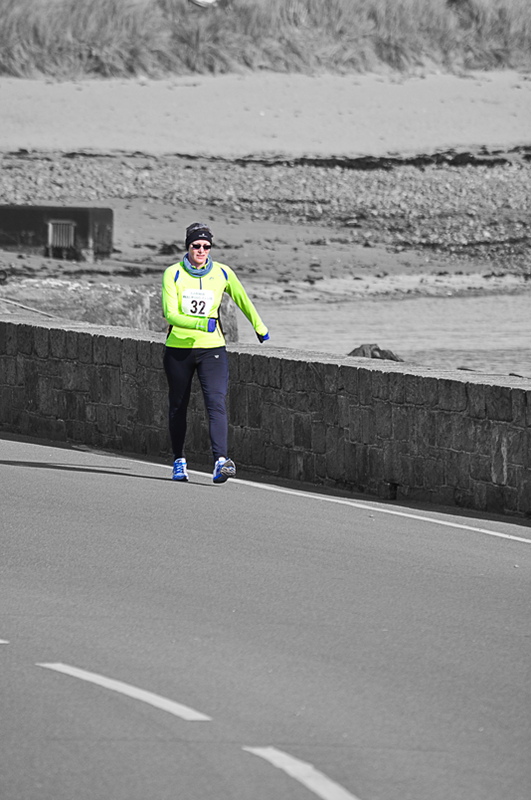 With favourable weather conditions for most of the race, Stuarts lead remained fairly static until the final half mile or so around Vale Castle when a strong head wind was met. 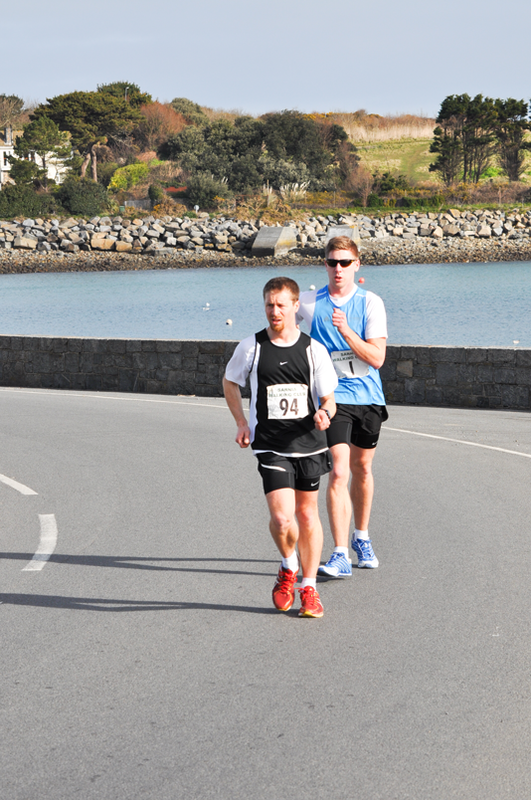 Jason struggled whilst leader Stuart opened up more of a gap to cross the line thirty seconds ahead in 41.50. 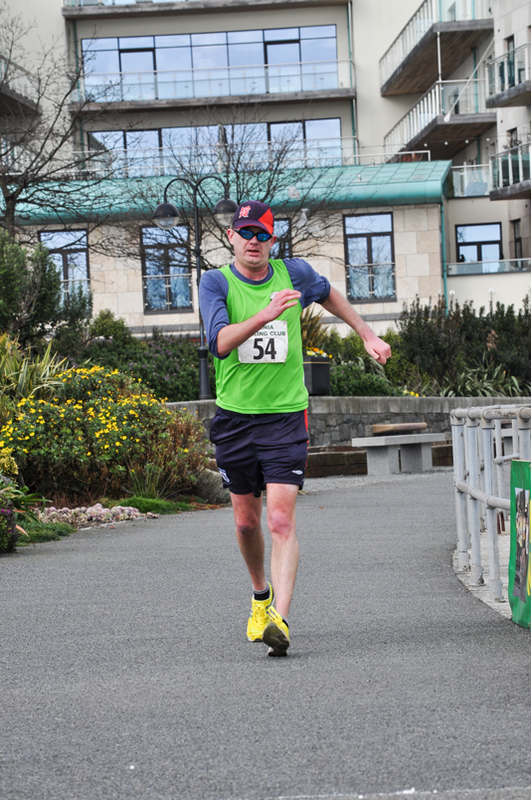 A distant third was Phil Lockwood in 46.56, a minute up on fourth placed Rob Elliott. 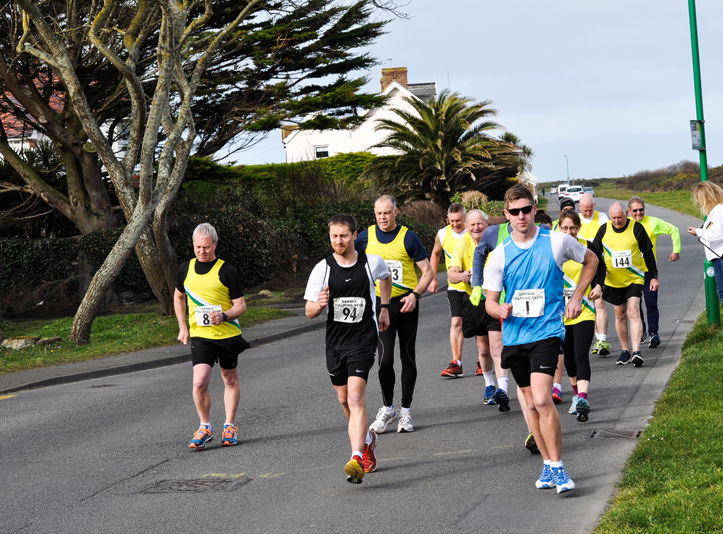 The next race is on Sunday February 24th at Footes Lane over a distance of 1 mile. 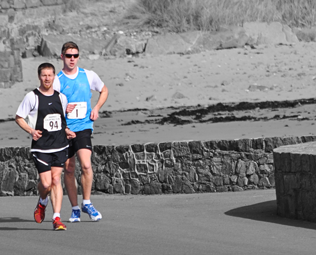 It will be the final walk in the Bob Wright Handicap Series starting at 9.30 am. 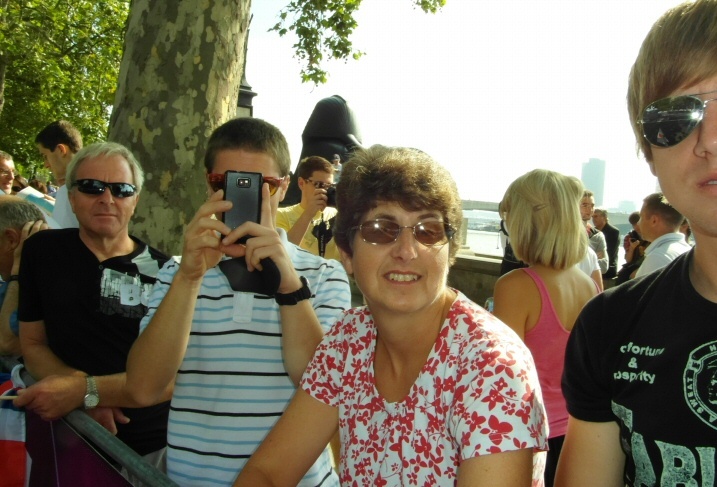 A group of Sarnia Walking Club members were taking in the Olympic race walks in London and watching Guernsey athlete Lee Merrien compete for Great Britain in the marathon over the recent days. 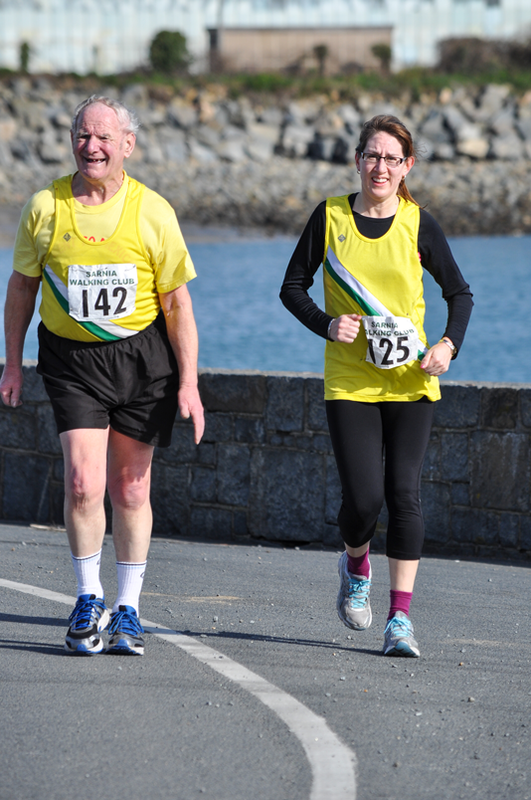 Hopefully inspired by watching the worlds best race walkers they will return to Guernsey competition with renewed enthuisiasm. 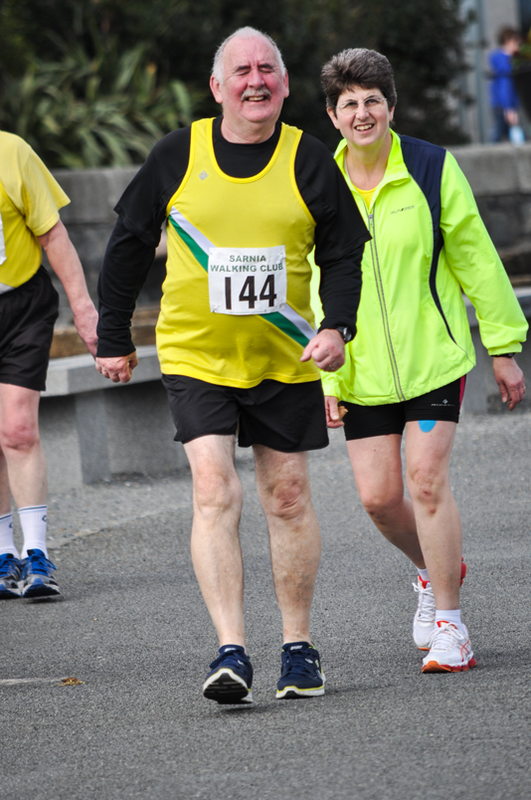 It was a chance to see old friends again amongst the huge crowds lining the 2 kilometres road walk course. Rob Elliott took the opportunity to meet walkers he last raced against thirty years ago in the Commonwealth Games, namely Murray Lambden from the Isle of Man and Tim Erickson, whose son competed in the 2012 Olympic walk, from Australia. 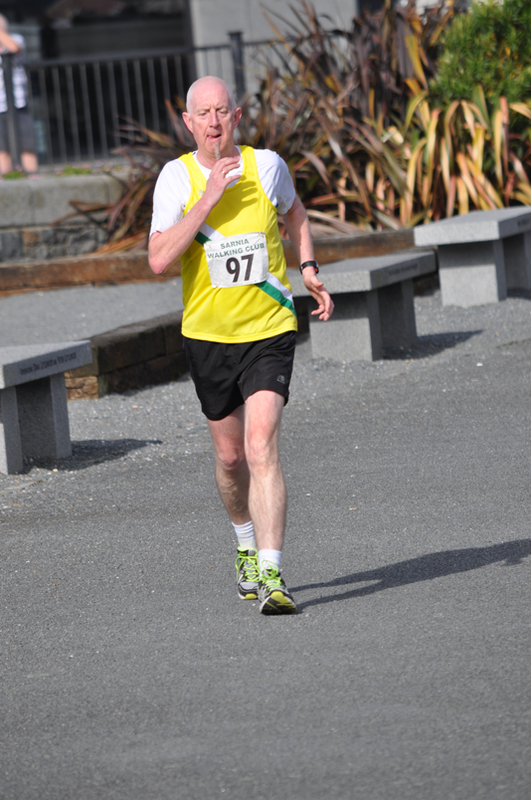 Peter Ryan, a past Church to Church winner from England took the photo of Rob talking to Tim after the 50kms race. 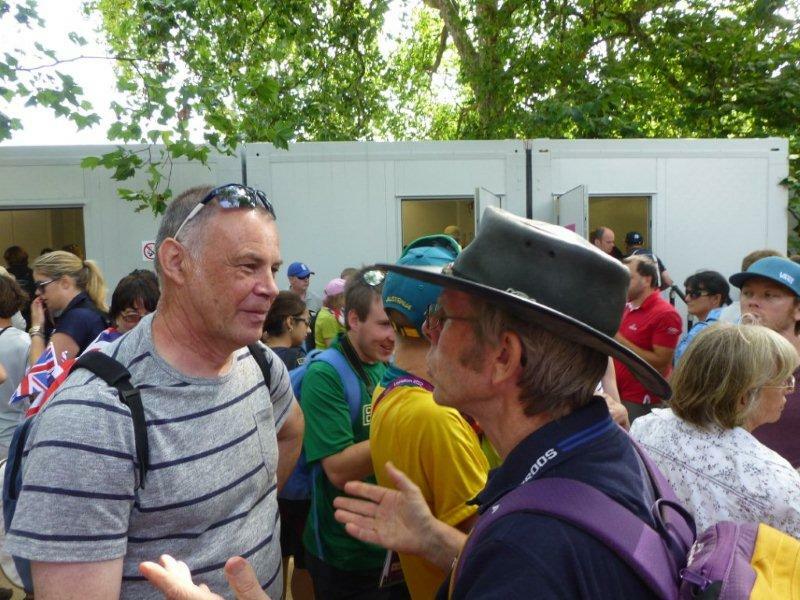 During the Olympics, Ron Wallwork organised a Friendship Walk at Enfield over various distances. 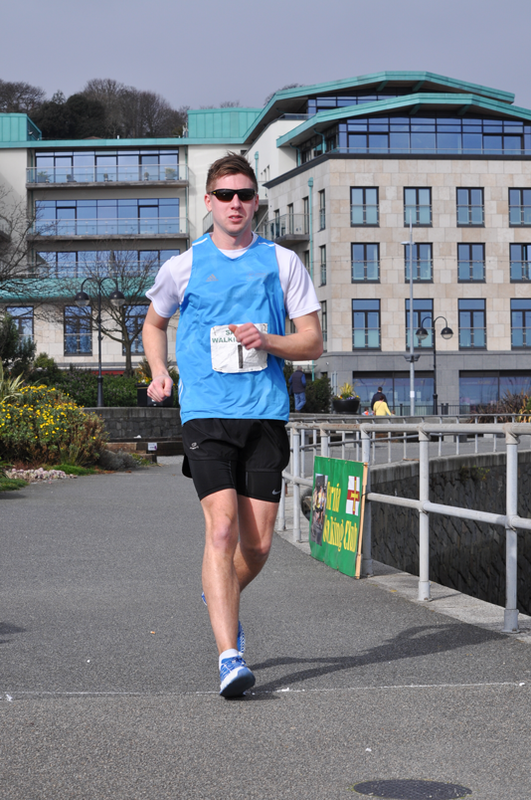 Carl Thomson raced the 5 miles event, finishing in third place in 39.47, close to race winner Fransisco Reis who won with 39.24. 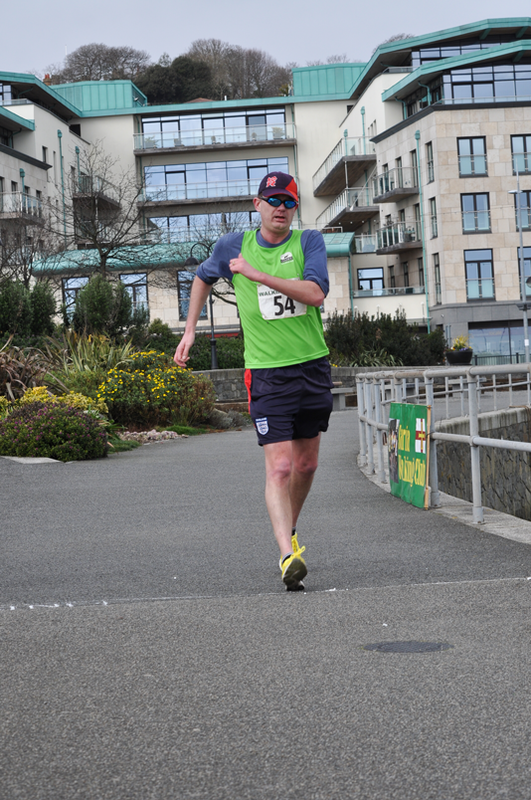 Ian Richards was third, only seconds behind Carl. 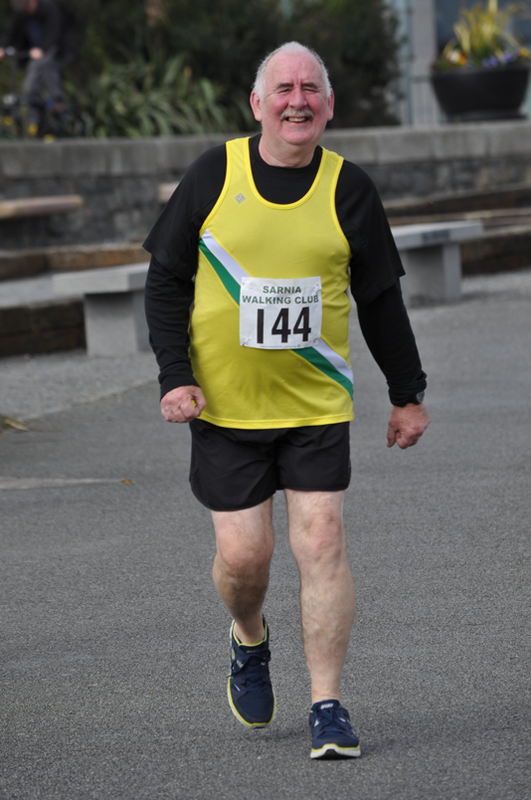 Carls time is a new Guernsey Age Best, beating the time of Mick Elliott who walked 40.37 back in 1984. Fast starts from Reis and Richards saw Carl 40 seconds down within a mile or so, clawed back in the latter stages as Richards was overtaken. Carl ran out of road as Reis hung on for the win. The Le Noury family at the marathon supporting Lee Merrien. 28. David Hoben (Surrey WC) 56.05 M55 7. C,hristian Haller (VSV Wuerzburg/Ger) 14.24 SM? New fixture list for March to September from the permanent page link on the right or here. Stuart Le Noury was a clear winner in the five miles road walk held between La Passee and North Side. 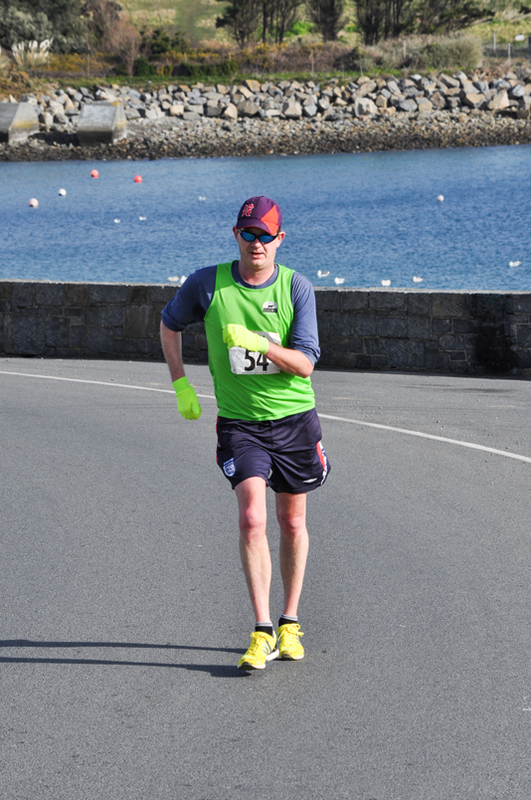 His winning time of 41.29 was almost four and a half minutes too quick for second man home Phil Lockwood. 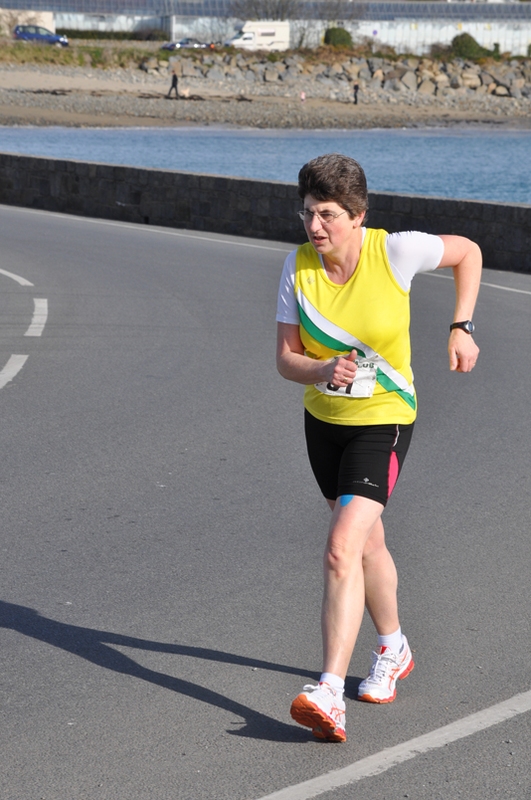 Rose Druckes, the second woman home behind Jayne Le Noury, improved her year old Guernsey age best time by thirty seconds, finishing in 59.06. Newcomers Joanne Le Prevost, Karen Farman and Hayley Phillips walked together at the rear of the field, walking across the finish line in 1.10.17. The next walk is on Sunday February 26th at Footes Lane at 9.30 am. 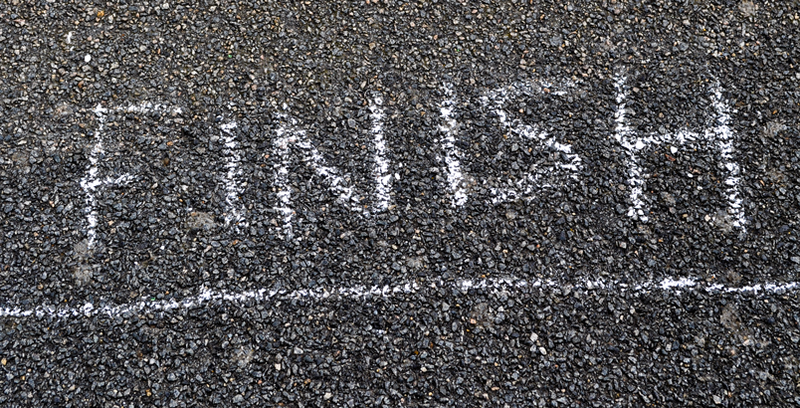 The distance is one mile and is the last race in the Bob Wright Handicap Series. Details from Jayne Le Noury, tel 246865.